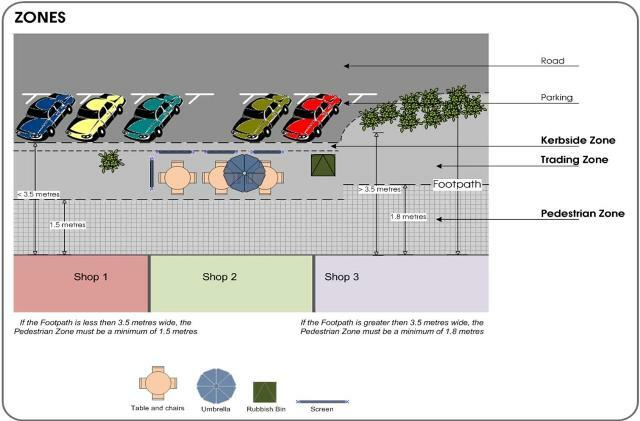 Do you need to use the footpath and/or roadway for operating stalls (including for raffles), advertising, or for selling goods or furniture? Council has a legal responsibility under the Disability Discrimination Act 1992, to ensure safe and equitable use of footpaths for people with a range of disabilities. The Human Rights and Equal Opportunity Commission recommends that in order for local government to fulfil its responsibilities under the Disability Discrimination Act 1992, footpaths should as far as possible allow for a continuous accessible path of travel extending from the property line at least 1.8 metres wide and 2.0 metres high, with no obstructions or projections, in order to provide the best possible guidance line for all users including people with disabilities. The placement of stalls (including raffle stalls), signs, goods and furniture on footpaths, roadways and other land under Council control can impede traffic movement and, in some circumstances, result in accidents. The placement of stalls, signs, goods and furniture on footpaths and roadways is regulated by Council’s Community Local Law No. 10, which states that a permit must be obtained from Council before a person uses any footpath for commercial activities. The Local Law also covers the location of furniture and associated equipment used for outdoor eating, signs, and displays of goods. Council’s intent isn’t to restrict trade; it is to highlight necessary requirements together with the need for compliance. Compliance is in everyone’s best interest, particularly in the event of an accident. Fill out an Application for Permit form at least fourteen (14) working days prior to using a stall, together with an indemnity form and proof of current $20,000,000 public liability cover. For further information on footpath trading and permits, please contact Council’s Compliance Officer on 1300 520 520.